The Start of First Grade! So today was our first day of first grade for Tonchi! I know everyone says your children grow up so fast, and I am a firm believer! I can’t believe he is already 6 and that he now has 3 younger siblings. I love them all dearly and can’t imagine life with out them, but how did it happen so fast? I remember as a child that we would have ice cream for lunch… yes… that was all we had for lunch on the first day of school each year! It was such a treat and we always looked forward to it! I wanted to do the same for my kiddos since I had so many great memories of the same! However, I wasn’t quite on my game this year and didn’t get it made in time. I had some chocolate ice cream left over that I had made a few weeks ago, but it certainly wasn’t going to be enough to feed these bottomless pits for lunch! I had wanted to make a few types and have some fun toppings, but it just didn’t happen this year… we can always hope for next year. So instead we had their favorite lunch and then had some flourless chocolate cake with chocolate ice cream for dessert! They were talking about it ALL morning and asking how much longer til lunch! I think it was a hit! Especially since we don’t have dessert very often, much less for lunch! It was a treat and a great start to the day! However, this year I wanted to post what books we are planning on using and then hopefully at the end of the year I can post an update and to how they worked, if we liked them and if we are likely to use them again! Kinda like a year end review! So listed below is what we are planing on accomplishing. Each book and it’s photo is a link to amazon with it’s pricing. However, I purchased most of these books either used (from curriculum sales or word of mouth) or from Rainbow Resource Center which consistently has cheaper pricing than amazon and has free shipping over $75. Their customer service is fantastic and they post reviews on almost any book you can think of! I definitely recommend checking them out! Community Bible Study on Thursdays($55 total for the year). It is a bible study group that meets at a church and has childcare/classes for the younger children and then has a bible study for the home schooled kids as well. We did this last year and it was fantastic and we are really looking forward to this year as well! 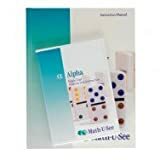 [amazon_link id=”1608260038″ target=”_blank” container=”” container_class=”” ]Math U See[/amazon_link] – Alpha – Teachers guide and DVD($10 used), Student book – $30 new. We used the Primer book last year and Tonchi did really well with it and really enjoyed math! I’ve flipped through this book and there is some review at the start of the year, but it looks like it is going to be fantastic! [amazon_link id=”160499178X” target=”_blank” container=”” container_class=”” ] [/amazon_link] I have a [amazon_link id=”160499178X” target=”_blank” container=”” container_class=”” ]Hooked on Phonics set for Kindergarten[/amazon_link] with about 20 of the super simple readers that go with it. I found it for FREE on freecycle and it’s been great! It also came with flash cards for sight words and we used it a little last year and will finish up reading the books this year. [amazon_link id=”0838814603″ target=”_blank” container=”” container_class=”” ] [/amazon_link][amazon_link id=”0838814603″ target=”_blank” container=”” container_class=”” ]Explode the Code[/amazon_link] ($2 used, but not written in at all). I’ve heard great things about these books. Tonchi likes it so far. I have level 1 and 1b which I think will be perfect for him. [amazon_link id=”0671631985″ target=”_blank” container=”” container_class=”” ] [/amazon_link][amazon_link id=”0671631985″ target=”_blank” container=”” container_class=”” ]Teach Your Child to Read in 100 Easy Lessons[/amazon_link] – ($1.50 – used) I’ve heard mixed reviews on this. It seems people either love it or hate it. I have it, but not sure we are going to use it. I couldn’t pass up the price and since Tonchi isn’t super enthusiastic about learning to read I wanted lots of options to help make it fun for him! [amazon_link id=”1933339004″ target=”_blank” container=”” container_class=”” ]Story of the World: Ancient Times Civilizations[/amazon_link] – (Text – $11, Activity guide – $6 purchased used, but like new condition) I’m super excited about this. The text reads like a story and both kids are really into it. Highly recommend the activity guide thus far. Has great activity ideas to go along with the lessons and has coloring pages and maps to learn as well. [amazon_link id=”1932012613″ target=”_blank” container=”” container_class=”” ]Apologia’s Exploring Creation with Zoology 1[/amazon_link] (Text $10, Journal $5 used, but never used) I really think we are going to like these as well. So far it seems a bit above their heads for both boys, but I think we are going to continue for now and just learn what we can and will go back to it again later if we need to. I did find the regular journal to be way too advanced for them, so I did purchase the Jr. Journal which was $18.50 new. [amazon_link id=”0963930710″ target=”_blank” container=”” container_class=”” ] [/amazon_link][amazon_link id=”0963930710″ target=”_blank” container=”” container_class=”” ]Draw.Write.Now [/amazon_link]($9.95/bk new) I love these and now would like to purchase the set of 10 books I think. It incorporates drawing with writing so that they learn to draw an animal and then write a few sentences about it. Also for $10 I think I purchased a bound book that gives them drawing space and writing space on the same page. We haven’t started this, but when Tonchi saw the book he wanted to start right away! [amazon_link id=”B001BOOMIA” target=”_blank” container=”” container_class=”” ]Write About Me/Write about My World[/amazon_link] – Good for beginning writers ($5 each, used) I think these will be great, but I’m not even sure we will get to them this year. Since Tonchi isn’t doing a lot of reading, I’m not sure how far we will get with writing, but it will be great for the future. [amazon_link id=”B005P3LOCU” target=”_blank” container=”” container_class=”” ]Handwriting Without Tears[/amazon_link] ($9.95 for the teachers guide and the same pricess for the workbook.) I did purchase both of these new since I couldn’t find them used. I’ve heard rave reviews with this as well and am excited to give it a try. My handwriting is terrible, but it isn’t because my mother didn’t try! I just have terrible penmanship and I certainly don’t want that for my children! Hopefully this will help us! Music: I’d like to start piano lessons this year. I started when I was 6 and I’d love to do the same. Since I’ve taken for so long and used to teach in the past lessons will be free to him! I also have lots of books for teaching packed away so I do need to get to those to see what we have. I don’t think I’ll need to purchase anything. We will see if we get to it this year! [amazon_link id=”1617160857″ target=”_blank” container=”” container_class=”” ]Rosetta Stone[/amazon_link] ($300 new for the complete set) This I have not purchased nor can I afford it! I’m also not 100% sure this is what I want. I’d like to start teaching him some Spanish this year, but haven’t found exactly what I want to use. I minored in Spanish in college so that will help me, but I definitely need some help! We may just start with some bilingual kids board books to build vocabulary and maybe I’ll read them some simple stories in Spanish as well. Still don’t have a formulated plan, but hopefully we can get something done! So those are our plans! Hopefully it all works out! I’ll hopefully keep you posted and let you know how it turns out come May/June of next year! AND… I will be thinking of what to do for second grade around then and am always looking for ideas and recommendations… so pass it along! I learned to read with the 100 Easy Lessons Book (one with a more 80’s-style cover of course!) and never stopped. It probably depends on learning styles but I loved it. Good luck to Tonchi! We have used Handwriting Without Tears before. We loved it! Especially my daughter Kaitlyn who learned cursive with it. It was a breeze for her to learn and she had fun doing it.